As Ramadan is next to the door for Muslims, I wanted to share this article for you all. Everyone has the right to follow his/her own religious rules, however, when it comes to fasting for diabetics, one should stop and think. During my study times (around 13 years ago), our professors were teaching against fasting, especially for diabetics. Today, there are many studies admitting the contrary: diabetics are allowed to fasting with some special precautions. a. Hypoglycemia – this is could be due to little food intake and/or when the changed dose of hypoglycemiants (oral) or/and insulin intake. b. Hyperglycemia – might happen because the reduced dose of medications used to control blood sugar. Furthermore, studies have reported severe cases of hyperglycemia in diabetics eating excessive amounts of foods or sugary beverages. c. Ketoacidosis – it happens commonly among type 1 diabetics or those diabetics taking insulin alone and had badly control their diabetes before Ramadan start. d. Dehydration – is partially caused because of reduced amount of fluids intake; and because of sweating and the other part due to osmotic diuresis (a characteristic of diabetes due to high blood sugar levels). e. Thrombosis – is induced by dehydration-derived blood-viscosity. Furthermore, it is good to be prepared before Ramadan. Make a decision, discuss with your doctor and follow the right strategy to avoid such complications when fasting during Ramadan. 1. 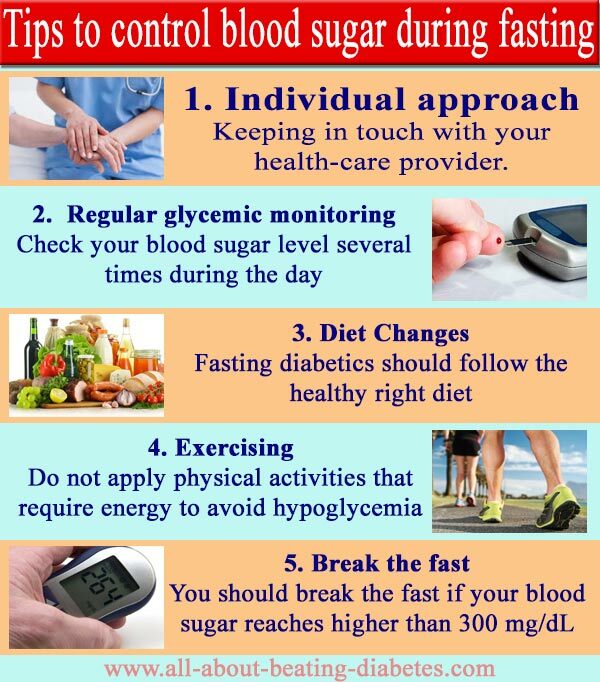 Individual approach – As fasting is a personal decision made in association with the right medical care, it is advisable to approach fasting diabetics according to their individual health conditions. In other words, keeping in touch with your health-care provider will help manage acute complications experienced during fasting. This is particularly true when it comes to changing the medication therapy you are following. 2. Regular glycemic monitoring – As everything might happen due to oscillations in blood sugar levels, you are advised to check them several times during the day, especially when it comes to patients under insulin treatment. 3. Diet Changes – Although fasting, diabetics should follow the healthy right diet. There is a common sense during fasting: people are advised to eat foods high in carbs and fats at the sunset meal; while they are advised to eat foods rich in proteins at the predawn meal. This is not the same for diabetics. As foods rich in simple carbohydrates could supply a large amount of sugar for a short period of time, the risk to have hyperglycemia (at the extreme level) is very high; therefore, complex carbohydrates are the best choices. 4. Exercising – Do not apply physical activities that require energy to avoid hypoglycemia. Simple walking steps are ok, especially after 2 hours after sunset meal. However, do not stop keeping “alive” with light exercise. 5. Break the fast – If your blood sugar drops to as lower as 70 mg/dL/3.9 mmol/L right after predawn meal or less than 60 mg/dL/3.3 mmol/L during the day to avoid extreme hypoglycemia. You should break the fast if your blood sugar reaches higher than 300 mg/dL (16.7 mmol/L).